The Webster Family Library, located in the Franklin M. Loew Veterinary Education Center on the Grafton campus, contains the largest collection of clinical veterinary medicine literature and resources in New England. The library provides access to books, journals and audio-visual materials—in analog and digital formats—in the fields of medicine and surgery for large, small and exotic animals; animal welfare; wildlife diseases and ecology; zoonotic diseases; conservation medicine; laboratory animal science, and veterinary practice management. 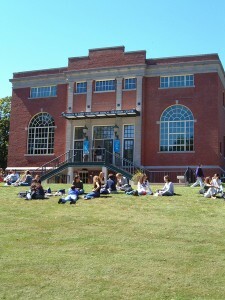 The Webster Family Library is intended for the use of students, faculty and staff of Cummings School of Veterinary Medicine at Tufts University. People unaffiliated with Tufts may visit the library and use materials needed for professional or scholarly research purposes which are not available at other libraries, on-site only. Visitors unaffiliated with Tufts should contact the library in advance to schedule an appointment (weekdays between 9:00am and 5:00pm) to ensure staff availability and to arrange for parking with the campus police.